Given the ongoing success of Table Cricket it is envisaged that this version could be just as successful by making the game accessible to the larger population of youngsters with a learning disability. Target Cricket has now been adopted as the official England and Wales Cricket Board version of the game in appropriate contests for those youngsters with a learning disability who require ongoing support. Other more able youngsters (MLD) should of course participate in modified Kwik Cricket. The game uses the traditional table tennis table and the established equipment for Table Cricket. 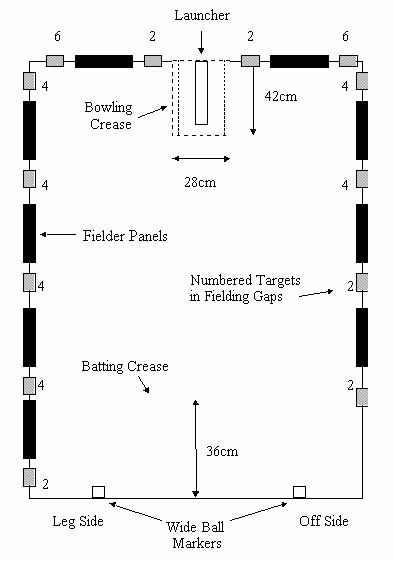 In this version there are 'sliding targets' which indicate the value of the gaps in between the larger sliding fielders on the respective panels and, to give a focus for the batter, also act as targets. The following is a brief outline of the aim of the game. The batter must aim to strike the ball into a fielding gap or actually strike the target in the gap. The target is then reversed on the side panel and that area is no longer a 'live' scoring option. The fielders, in turn, bowl only one ball each to the batter and then they rotate one place so the next fielder bowls the next ball. This is so the participant's motivation level and focus can be constantly maintained. Further information on the development of Target Cricket. the use of a bowler’s crease for an active bowler/fielder. In Target Cricket the team starts with only 20 runs and have two runs deducted for each wicket or crease rules infringement or wide ball incident. Batters may play with a horizontal or angled bat. The batter will be out if the ball is struck before it crosses the batter’s crease line. Runs will be scored if the ball is hit into the live gaps in between the sliding fielders or actually striking a target . The caught and bowled rule therefore, does not apply in Target Cricket. The nearest fielder then reverses the target to face the outside of the panel so no more runs can be scored in that gap from then on - i.e. it is not in play/live. When a batter has finished their innings all the reversed fielders are reset – facing inwards for the next batter. In Target Cricket all of the six fielders bowl only one ball each to the current batter. They do this by rotating anti-clockwise after the ball is dead following each bowl. The bowlers may use the bowling launcher (by rotating it slightly within the crease area) to be an active fielder if the ball comes straight at them. They may therefore intercept the ball by deflecting it away from the long off and on fielders, back to wards the side panels. If as a consequence the ball strikes a fielder it is fielded; strikes a red zone it is a relayed catch -caught out; or strikes a ‘live target zone’ it scores – a miss field - and the target is reversed as usual. If the bowler moves the launcher over any part of the crease line it is a ‘no ball’, and one run is added. The biased/swing ball is not used in Target Cricket so these rule 8 bullet 10 and 11 are not valid. In Target Cricket the field placings are set out at the beginning of each batter’s innings and cannot be changed until the next batter comes in. There are no active side panel fielders in Target Cricket – only the active bowler. For those participants with mainly learning disabilities an agreement should be reached between the respective coaches (or organisers of competitions) about the level of support and guidance permitted. This may have to be modified to allow positive support but not actual directions so the overall outcome of the game is not influenced in a major way. In principle these apply, however it will depend upon which rules version is being played – see the versions in the introduction. Aspects a) to g) are not relevant. Instead rule 7 - batting and scoring - aspects a), b) and c) should be used for appropriate 'classification' procedures. Note rule 12 e) should also be applied in parallel for those competitions for youngsters with learning disabilities, i.e. some youngsters with 'potential' should be playing Kwik Cricket. Coaching maybe required so 'ballistic types' of strokes don’t evolve. All apply. Some participants could eventually be coached to use the swing ball so they could play other forms of the game of Target Cricket. The first four bullet points apply. There are no active fielders in Target Cricket as active fielding does not occur. Active bowling applies. Downs: In the main yes. However, some higher functioning individuals will be too capable. Grey areas of profound and multiple impairments which require 'high supports' needs. Two or four plastic sides can be screwed to a wooden batton, this can then be just slotted into two guide brackets fixed to the table side (DIY). This saves the use of clips or tape so youngsters can be independent.